We work in a highly interdisciplinary environment at the interface of computer science and biology. 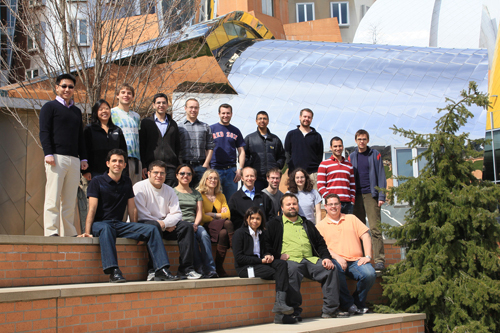 Members of the group come from a primarily computational background and share a strong passion for understanding biological systems. We are engaged in several collaborative research partnerships with biological and experimental collaborators, at the Broad Institute, the ENCODE, modENCODE, GTEx, and Epigenomics Roadmap consortia, the Harvard Medical School, and other universities. We seek to understand the mechanistic basis of human disease, using a combination of computational and experimental techniques. This involves developing methods for (1) the systematic discovery and characterization of functional elements in the human genome, (2) the discovery and validation of the gene-regulatory circuitry controling these elements, (3) the use of epigenomic information for annotating regulatory regions and their activity across different cell types, and (4) the use of comparative genomics for recognizing coding and non-coding regions of functional importance for evolutionary fitness. Variation and Disease: Translating genetic findings into therapeutics remains an unsolved challenge, partly because in 93% of cases, disease-associated common variants do not disrupt proteins directly, but instead alter their genomic control elements. Our group develops and uses epigenomic maps of regulatory elements, and cellular circuits linking them to their regulators and target genes, in order to understand how human genetic variation contributes to disease and cancer. We have developed resources and methods for studying how genetic variation impacts gene expression, regualtory region activity, cellular phenotypes, and ultimately human disease. We have applied these methods to obesity, Alzheimer's disease, cardiovascular traits, psychiatric disorders, and cancer, resulting in multiple insights. In addition to dissecting these circuits, we have used gene manilations and genome editing to reverse the phenotypic signatures of disease from risk and non-risk individuals, paving the way for genomics-based therapeutics. Genome Interpretation: We have developed comparative genomics methods which can directly discover diverse functional genomic elements based on their characteristic patterns of evolutionary change across related species. These "evolutionary signatures" are dictated by precise functional constraints unique to each class of functional elements, thus enabling their genome-wide discovery. We have used such signatures in the human, fly, and yeast genomes to recognize protein-coding genes and exons, RNA genes and structures, microRNAs and their targets, and diverse classes of regulatory elements. 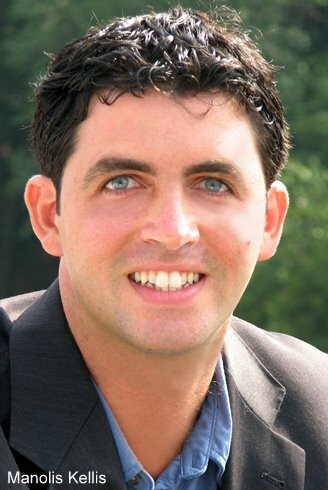 This has resulted in many surprising findings and new insights, including extensive stop-codon read-through in adult brain proteins, novel types of RNA structures involved in post-transcriptional and translational regulation, miRNA targeting in protein-coding regions, functionality of both arms of a miRNA hairpin, and both sense and anti-sense miRNAs, and the discovery of a new class of long intergenic non-coding RNAs. Gene regulation: We have also developed computational methods to study the cellular circuitry of genomes, which directs gene expression levels in response to environmental and developmental stimuli. Our work has resulted in global maps of regulatory elements in yeast and animal genomes, and their role in specifying pre- and post-transcriptional gene regulatory networks. Combining comparative genomics with experimental datasets, we have studied condition-specific and tissue-specific activation networks, and revealed new insights on activation and silencing of developmental genes, and post-transcriptional targeting by miRNA genes. Epigenomics: With the recent availability of genome-wide maps of histone modifications, we have developed new methods for the systematic discovery of recurrent combinations of chromatin marks, or "chromatin signatures," which we found to be associated with very specific types of functional elements, including diverse classes of enhancers, promoters, and insulators. We have used these signatures to discover new elements, including novel non-coding RNA genes, and to systematically study the dynamics of chromatin state across tissues and during development, and to discover the sequence elements and grammars governing those changes. We are currently also exploring the role of small non-coding RNAs in the establishment, maintenance, and targeting of chromatin state. Genome evolution: We have also developed methods to study systematic differences between the species compared, and uncovered important evolutionary mechanisms for the emergence of new functions. Our work provided definitive proof of an ancestral whole-genome duplication in yeast, which led to a complete doubling of the gene count, and was rapidly followed by massive gene loss, asymmetric divergence, and new gene functions. To further understand the evolutionary processes leading to new functions, we developed a phylogenomic framework for studying gene family evolution in the context of complete genomes, revealing two largely independent evolutionary forces, dictating gene- and species-specific mutation rates. De-coupling these two rates also allowed us to develop the first machine-learning approach to phylogeny, resulting in drastically higher accuracies than any existing phylogenetic method. More on: Evolution - Phylogenomics. 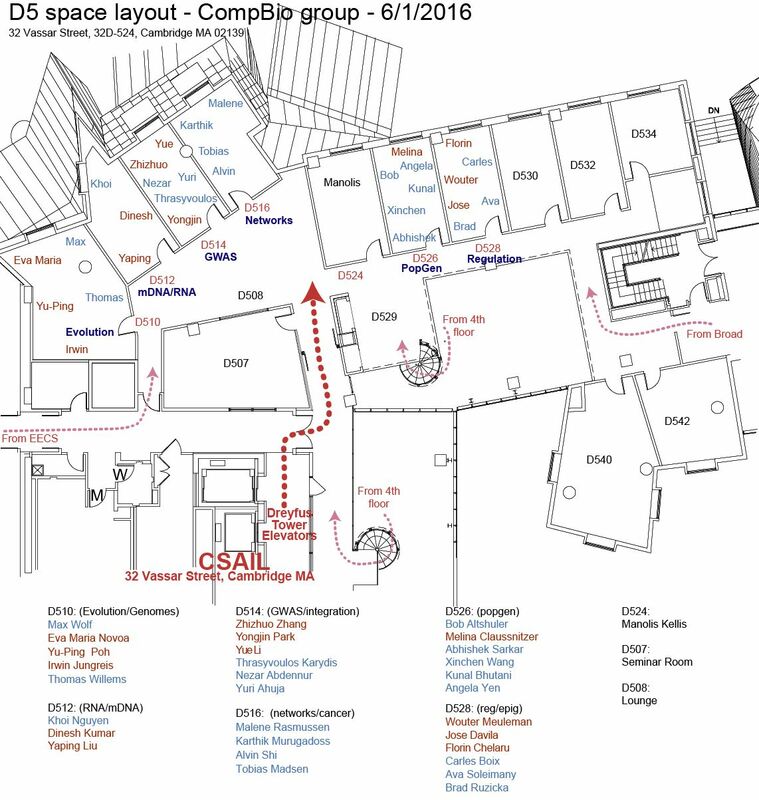 We are located on the 5th floor (D5) of MIT Stata Center, a truly unique building that stretches the imagination, and home of the Computer Science and Artificial Intelligence Lab (CSAIL). We are just across Main Street from the Broad Institute, which boasts a unique collaborative environment for genomics, and we have weekly meetings in both institutions. Massively parallel reporter assays (MPRAs) enable nucleotide-resolution dissection of transcriptional regulatory regions, such as enhancers, but only few regions at a time. Here we present a combined experimental and computational approach, Systematic high-resolution activation and repression profiling with reporter tiling using MPRA (Sharpr-MPRA), that allows high-resolution analysis of thousands of regions simultaneously. Sharpr-MPRA combines dense tiling of overlapping MPRA constructs with a probabilistic graphical model to recognize functional regulatory nucleotides, and to distinguish activating and repressive nucleotides, using their inferred contribution to reporter gene expression. 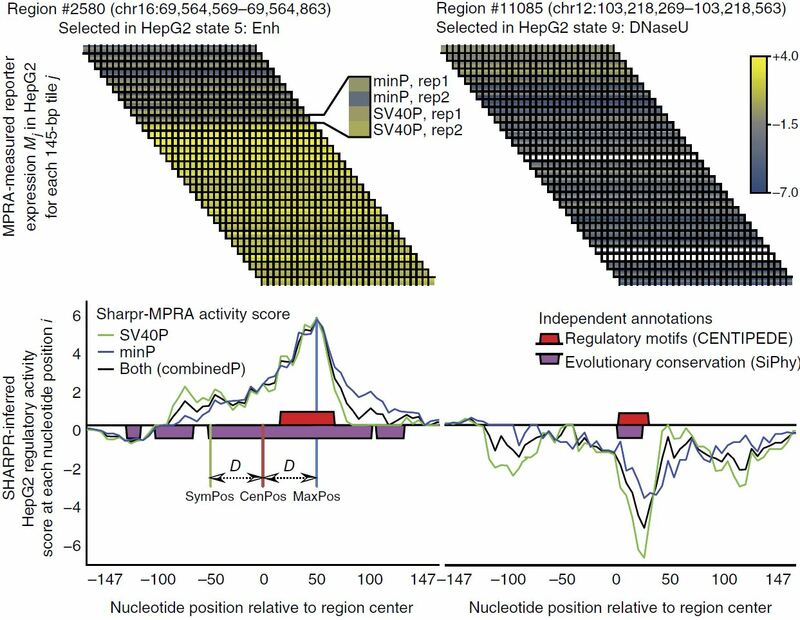 We used Sharpr-MPRA to test 4.6 million nucleotides spanning 15,000 putative regulatory regions tiled at 5-nucleotide resolution in two human cell types. Our results recovered known cell-type-specific regulatory motifs and evolutionarily conserved nucleotides, and distinguished known activating and repressive motifs. Our results also showed that endogenous chromatin state and DNA accessibility are both predictive of regulatory function in reporter assays, identified retroviral elements with activating roles, and uncovered 'attenuator' motifs with repressive roles in active chromatin. Translational stop codon readthrough emerged as a major regulatory mechanism affecting hundreds of genes in animal genomes, based on recent comparative genomics and ribosomal profiling evidence, but its evolutionary properties remain unknown. Here, we leverage comparative genomic evidence across 21 Anopheles mosquitoes to systematically annotate readthrough genes in the malaria vector Anopheles gambiae, and to provide the first study of abundant readthrough evolution, by comparison with 20 Drosophila species. 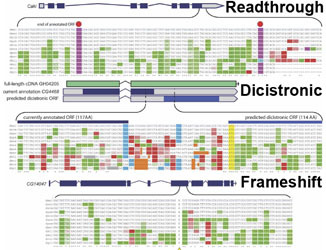 Using improved comparative genomics methods for detecting readthrough, we identify evolutionary signatures of conserved, functional readthrough of 353 stop codons in the malaria vector, Anopheles gambiae, and of 51 additional Drosophila melanogaster stop codons, including several cases of double and triple readthrough and of readthrough of two adjacent stop codons. We find that most differences between the readthrough repertoires of the two species arose from readthrough gain or loss in existing genes, rather than birth of new genes or gene death; that readthrough-associated RNA structures are sometimes gained or lost while readthrough persists; that readthrough is more likely to be lost at TAA and TAG stop codons; and that readthrough is under continued purifying evolutionary selection in mosquito, based on population genetic evidence. We also determine readthrough-associated gene properties that predate readthrough, and identify differences in the characteristic properties of readthrough genes between clades. We estimate more than 600 functional readthrough stop codons in mosquito and 900 in fruit fly, provide evidence of readthrough control of peroxisomal targeting, and refine the phylogenetic extent of abundant readthrough as following divergence from centipede. Genome wide association studies (GWAS) provide a powerful approach for uncovering disease-associated variants in human, but fine-mapping the causal variants remains a challenge. This is partly remedied by prioritization of disease-associated variants that overlap GWAS-enriched epigenomic annotations. Here, we introduce a new Bayesian model RiVIERA (Risk Variant Inference using Epigenomic Reference Annotations) for inference of driver variants from summary statistics across multiple traits using hundreds of epigenomic annotations. 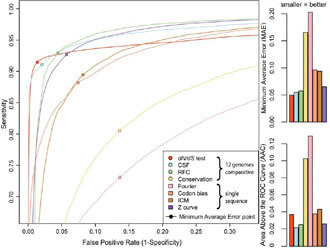 In simulation, RiVIERA promising power in detecting causal variants and causal annotations, the multi-trait joint inference further improved the detection power. We applied RiVIERA to model the existing GWAS summary statistics of 9 autoimmune diseases and Schizophrenia by jointly harnessing the potential causal enrichments among 848 tissue-specific epigenomics annotations from ENCODE/Roadmap consortium covering 127 cell/tissue types and 8 major epigenomic marks. 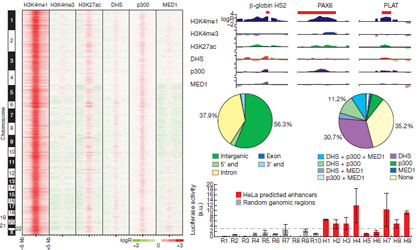 RiVIERA identified meaningful tissue-specific enrichments for enhancer regions defined by H3K4me1 and H3K27ac for Blood T-Cell specifically in the nine autoimmune diseases and Brain-specific enhancer activities exclusively in Schizophrenia. Moreover, the variants from the 95% credible sets exhibited high conservation and enrichments for GTEx whole-blood eQTLs located within transcription-factor-binding-sites and DNA-hypersensitive-sites. Furthermore, joint modeling the nine immune traits by simultaneously inferring and exploiting the underlying epigenomic correlation between traits further improved the functional enrichments compared to single-trait models. Genetic variants identified by genome-wide association studies explain only a modest proportion of heritability, suggesting that meaningful associations lie 'hidden' below current thresholds. Here, we integrate information from association studies with epigenomic maps to demonstrate that enhancers significantly overlap known loci associated with the cardiac QT interval and QRS duration. We apply functional criteria to identify loci associated with QT interval that do not meet genome-wide significance and are missed by existing studies. 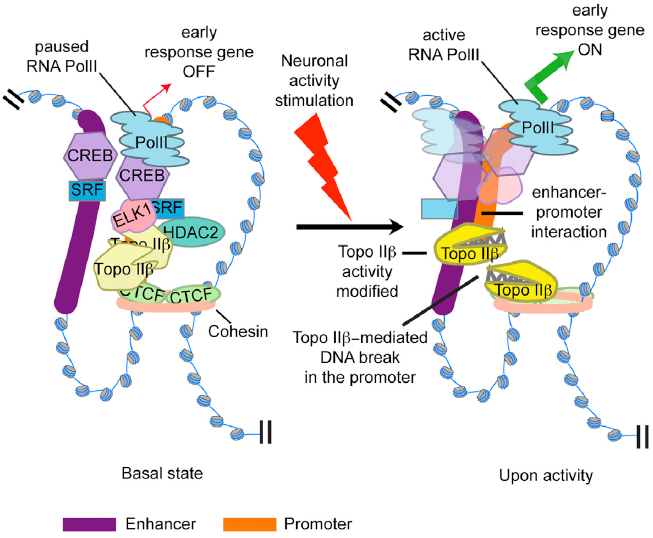 We demonstrate that these 'sub-threshold' signals represent novel loci, and that epigenomic maps are effective at discriminating true biological signals from noise. We experimentally validate the molecular, gene-regulatory, cellular and organismal phenotypes of these sub-threshold loci, demonstrating that most sub-threshold loci have regulatory consequences and that genetic perturbation of nearby genes causes cardiac phenotypes in mouse. Our work provides a general approach for improving the detection of novel loci associated with complex human traits. More than 90% of common variants associated with complex traits do not affect proteins directly, but instead the circuits that control gene expression. This has increased the urgency of understanding the regulatory genome as a key component for translating genetic results into mechanistic insights and ultimately therapeutics. To address this challenge, we developed HaploReg (http://compbio.mit.edu/HaploReg) to aid the functional dissection of genome-wide association study (GWAS) results, the prediction of putative causal variants in haplotype blocks, the prediction of likely cell types of action, and the prediction of candidate target genes by systematic mining of comparative, epigenomic and regulatory annotations. 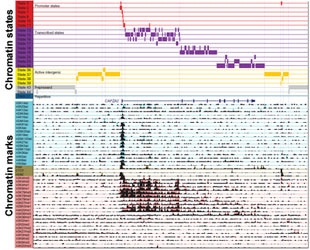 Since first launching the website in 2011, we have greatly expanded HaploReg, increasing the number of chromatin state maps to 127 reference epigenomes from ENCODE 2012 and Roadmap Epigenomics, incorporating regulator binding data, expanding regulatory motif disruption annotations, and integrating expression quantitative trait locus (eQTL) variants and their tissue-specific target genes from GTEx, Geuvadis, and other recent studies. We present these updates as HaploReg v4, and illustrate a use case of HaploReg for attention deficit hyperactivity disorder (ADHD)-associated SNPs with putative brain regulatory mechanisms. Nucleic Acids Res. 2015 Dec 10. pii: gkv1340. Madabhushi, Gao, Pfenning, Pan, Yamakawa, Seo, Rueda, Phan, Yamakawa, Pao, Stott, Gjoneska, Nott, Cho, Kellis, Tsai. With hundreds of epigenomic maps, the opportunity arises to exploit the correlated nature of epigenetic signals, across both marks and samples, for large-scale prediction of additional datasets. Here, we undertake epigenome imputation by leveraging such correlations through an ensemble of regression trees. We impute 4,315 high-resolution signal maps, of which 26% are also experimentally observed. Imputed signal tracks show overall similarity to observed signals and surpass experimental datasets in consistency, recovery of gene annotations and enrichment for disease-associated variants. We use the imputed data to detect low-quality experimental datasets, to find genomic sites with unexpected epigenomic signals, to define high-priority marks for new experiments and to delineate chromatin states in 127 reference epigenomes spanning diverse tissues and cell types. Our imputed datasets provide the most comprehensive human regulatory region annotation to date, and our approach and the ChromImpute software constitute a useful complement to large-scale experimental mapping of epigenomic information. With the completion of the human genome sequence, attention turned to identifying and annotating its functional DNA elements. As a complement to genetic and comparative genomics approaches, the Encyclopedia of DNA Elements Project was launched to contribute maps of RNA transcripts, transcriptional regulator binding sites, and chromatin states in many cell types. The resulting genome-wide data reveal sites of biochemical activity with high positional resolution and cell type specificity that facilitate studies of gene regulation and interpretation of noncoding variants associated with human disease. However, the biochemically active regions cover a much larger fraction of the genome than do evolutionarily conserved regions, raising the question of whether nonconserved but biochemically active regions are truly functional. Here, we review the strengths and limitations of biochemical, evolutionary, and genetic approaches for defining functional DNA segments, potential sources for the observed differences in estimated genomic coverage, and the biological implications of these discrepancies. We also analyze the relationship between signal intensity, genomic coverage, and evolutionary conservation. Our results reinforce the principle that each approach provides complementary information and that we need to use combinations of all three to elucidate genome function in human biology and disease. Long intergenic noncoding RNAs (lincRNAs) play diverse regulatory roles in human development and disease, but little is known about their evolutionary history and constraint. 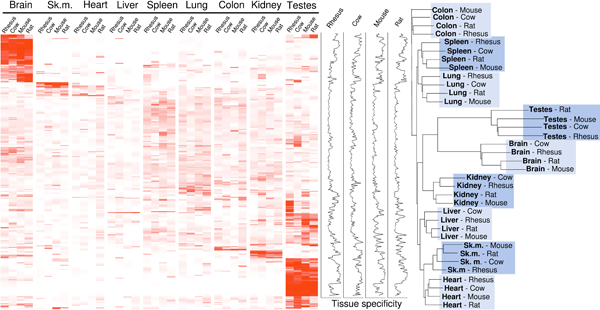 Here, we characterize human lincRNA expression patterns in nine tissues across six mammalian species and multiple individuals. Of the 1898 human lincRNAs expressed in these tissues, we find orthologous transcripts for 80% in chimpanzee, 63% in rhesus, 39% in cow, 38% in mouse, and 35% in rat. Mammalian-expressed lincRNAs show remarkably strong conservation of tissue specificity, suggesting that it is selectively maintained. 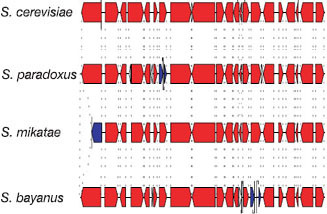 In contrast, abundant splice-site turnover suggests that exact splice sites are not critical. Relative to evolutionarily young lincRNAs, mammalian-expressed lincRNAs show higher primary sequence conservation in their promoters and exons, increased proximity to protein-coding genes enriched for tissue-specific functions, fewer repeat elements, and more frequent single-exon transcripts. Remarkably, we find that ~20% of human lincRNAs are not expressed beyond chimpanzee and are undetectable even in rhesus. These hominid-specific lincRNAs are more tissue specific, enriched for testis, and faster evolving within the human lineage. Many biologically important RNA structures are conserved in evolution leading to characteristic mutational patterns. 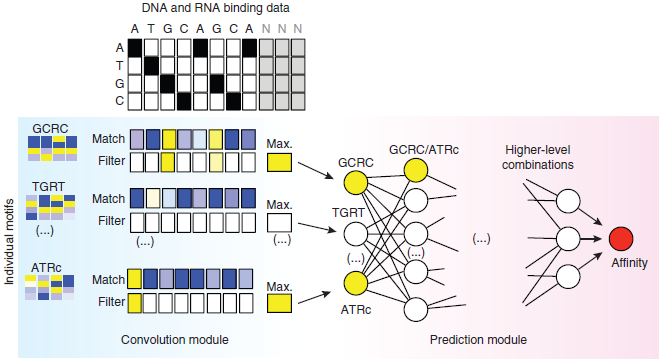 RNAalifold is a widely used program to predict consensus secondary structures in multiple alignments by combining evolutionary information with traditional energy-based RNA folding algorithms. Here we describe the theory and applications of the RNAalifold algorithm. Consensus secondary structure prediction not only leads to significantly more accurate structure models, but it also allows to study structural conservation of functional RNAs. RNA has a dual role as an informational molecule and a direct effector of biological tasks. The latter function is enabled by RNA's ability to adopt complex secondary and tertiary folds and thus has motivated extensive computational1, 2 and experimental3, 4, 5, 6, 7, 8 efforts for determining RNA structures. Existing approaches for evaluating RNA structure have been largely limited to in vitro systems, yet the thermodynamic forces which drive RNA folding in vitro may not be sufficient to predict stable RNA structures in vivo5. Indeed, the presence of RNA-binding proteins and ATP-dependent helicases can influence which structures are present inside cells. Here we present an approach for globally monitoring RNA structure in native conditions in vivo with single-nucleotide precision. This method is based on in vivo modification with dimethyl sulphate (DMS), which reacts with unpaired adenine and cytosine residues9, followed by deep sequencing to monitor modifications. Our data from yeast and mammalian cells are in excellent agreement with known messenger RNA structures and with the high-resolution crystal structure of the Saccharomyces cerevisiae ribosome10. Comparison between in vivo and in vitro data reveals that in rapidly dividing cells there are vastly fewer structured mRNA regions in vivo than in vitro. Even thermostable RNA structures are often denatured in cells, highlighting the importance of cellular processes in regulating RNA structure. 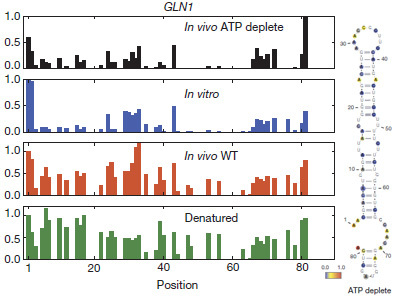 Indeed, analysis of mRNA structure under ATP-depleted conditions in yeast shows that energy-dependent processes strongly contribute to the predominantly unfolded state of mRNAs inside cells. 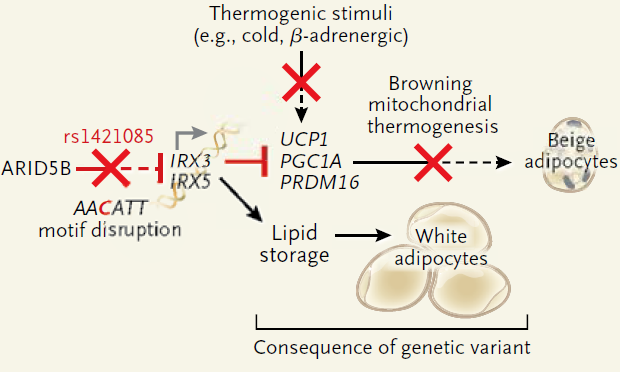 Our studies broadly enable the functional analysis of physiological RNA structures and reveal that, in contrast to the Anfinsen view of protein folding whereby the structure formed is the most thermodynamically favourable, thermodynamics have an incomplete role in determining mRNA structure in vivo. Accurate gene tree-species tree reconciliation is fundamental to inferring the evolutionary history of a gene family. 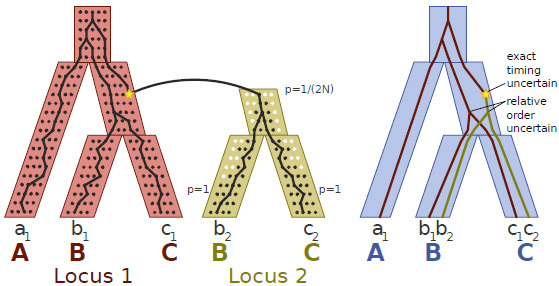 However, although it has long been appreciated that population-related effects such as incomplete lineage sorting (ILS) can dramatically affect the gene tree, many of the most popular reconciliation methods consider discordance only due to gene duplication and loss (and sometimes horizontal gene transfer). Methods that do model ILS are either highly parameterized or consider a restricted set of histories, thus limiting their applicability and accuracy. To address these challenges, we present a novel algorithm DLCpar for inferring a most parsimonious (MP) history of a gene family in the presence of duplications, losses, and ILS. Our algorithm relies on a new reconciliation structure, the labeled coalescent tree (LCT), that simultaneously describes coalescent and duplication-loss history. We show that the LCT representation enables an exhaustive and efficient search over the space of reconciliations, and, for most gene families, the least common ancestor (LCA) mapping is an optimal solution for the species mapping between the gene tree and species tree in a MP LCT. Applying our algorithm to a variety of clades, including flies, fungi, and primates, as well as to simulated phylogenies, we achieve high accuracy, comparable to sophisticated probabilistic reconciliation methods, at reduced runtime and with far fewer parameters. These properties enable inference of complex evolution of gene families across a broad range of species and large data sets. Genome Research 24(3):475-86, Dec 5, 2013. The majority of disease-associated variants lie outside protein-coding regions, suggesting a link between variation in regulatory regions and disease predisposition. We studied differences in chromatin states using five histone modifications, cohesin, and CTCF in lymphoblastoid lines from 19 individuals of diverse ancestry. We found extensive signal variation in regulatory regions, which often switch between active and repressed states across individuals. Enhancer activity is particularly diverse among individuals, whereas gene expression remains relatively stable. 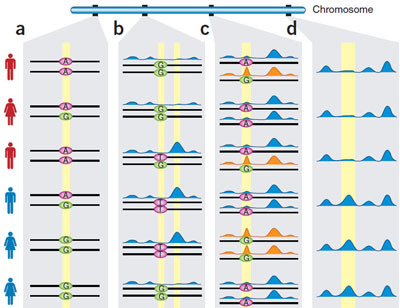 Chromatin variability shows genetic inheritance in trios, correlates with genetic variation and population divergence, and is associated with disruptions of transcription factor binding motifs. Overall, our results provide insights into chromatin variation among humans. Phylogenetic tree reconciliation is a powerful approach for inferring evolutionary events like gene duplication, horizontal gene transfer, and gene loss, which are fundamental to our understanding of molecular evolution. While duplication-loss (DL) reconciliation leads to a unique maximum-parsimony solution, duplication-transfer-loss (DTL) reconciliation yields a multitude of optimal solutions, making it difficult to infer the true evolutionary history of the gene family. This problem is further exacerbated by the fact that different event cost assignments yield different sets of optimal reconciliations. Here, we present an effective, efficient, and scalable method for dealing with these fundamental problems in DTL reconciliation. Our approach works by sampling the space of optimal reconciliations uniformly at random and aggregating the results. We show that even gene trees with only a few dozen genes often have millions of optimal reconciliations and present an algorithm to efficiently sample the space of optimal reconciliations uniformly at random in O(mn(2)) time per sample, where m and n denote the number of genes and species, respectively. We use these samples to understand how different optimal reconciliations vary in their node mappings and event assignments and to investigate the impact of varying event costs. We apply our method to a biological dataset of approximately 4700 gene trees from 100 taxa and observe that 93% of event assignments and 73% of mappings remain consistent across different multiple optima. Our analysis represents the first systematic investigation of the space of optimal DTL reconciliations and has many important implications for the study of gene family evolution. RECOMB 2013 and Journal of Computational Biology 20:738-54, Sept 14, 2013. Although only 5% of the human genome is conserved across mammals, a substantially larger portion is biochemically active, raising the question of whether the additional elements evolve neutrally or confer a lineage-specific fitness advantage. To address this question, we integrate human variation information from the 1000 Genomes Project and activity data from the ENCODE Project. 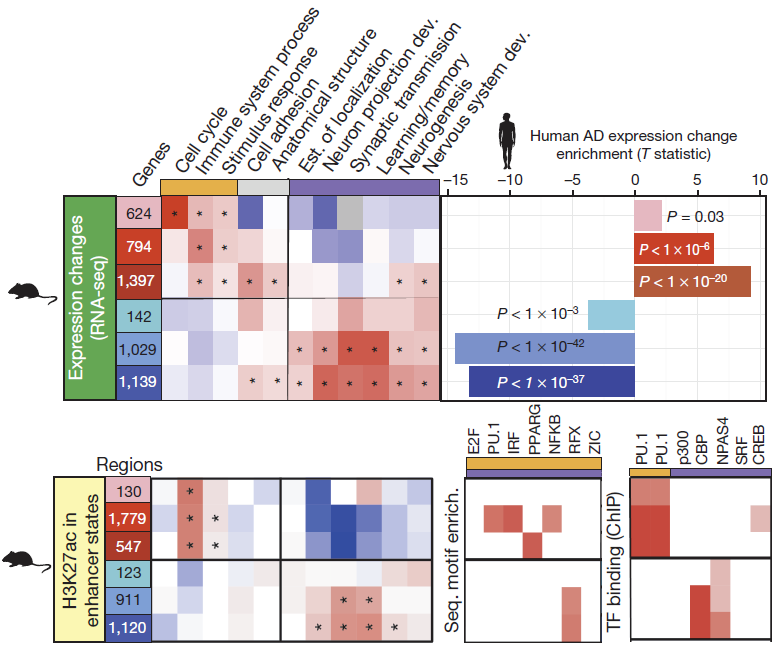 A broad range of transcribed and regulatory nonconserved elements show decreased human diversity, suggesting lineage-specific purifying selection. Conversely, conserved elements lacking activity show increased human diversity, suggesting that some recently became nonfunctional. Regulatory elements under human constraint in nonconserved regions were found near color vision and nerve-growth genes, consistent with purifying selection for recently evolved functions. 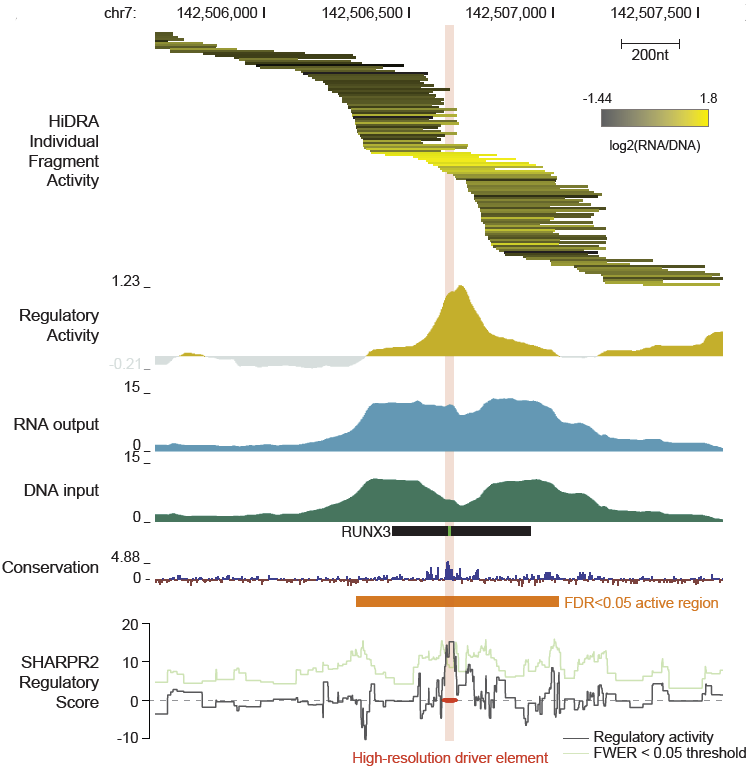 Our results suggest continued turnover in regulatory regions, with at least an additional 4% of the human genome subject to lineage-specific constraint. The human genome encodes the blueprint of life, but the function of the vast majority of its nearly three billion bases is unknown. The Encyclopedia of DNA Elements (ENCODE) project has systematically mapped regions of transcription, transcription factor association, chromatin structure and histone modification. These data enabled us to assign biochemical functions for 80% of the genome, in particular outside of the well-studied protein-coding regions. 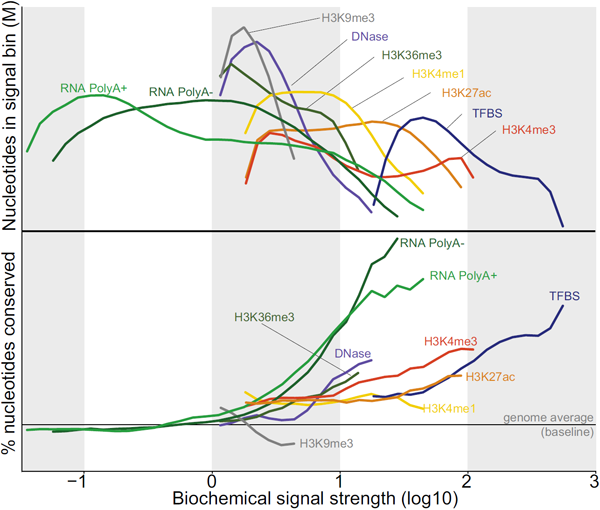 Many discovered candidate regulatory elements are physically associated with one another and with expressed genes, providing new insights into the mechanisms of gene regulation. The newly identified elements also show a statistical correspondence to sequence variants linked to human disease, and can thereby guide interpretation of this variation. Overall, the project provides new insights into the organization and regulation of our genes and genome, and is an expansive resource of functional annotations for biomedical research. The comparison of related genomes has emerged as a powerful lens for genome interpretation. Here we report the sequencing and comparative analysis of 29 eutherian genomes. We confirm that at least 5.5% of the human genome has undergone purifying selection, and locate constrained elements covering 4.2% of the genome. We use evolutionary signatures and comparisons with experimental data sets to suggest candidate functions for 60% of constrained bases. These elements reveal a small number of new coding exons, candidate stop codon readthrough events and over 10,000 regions of overlapping synonymous constraint within protein-coding exons. We find 220 candidate RNA structural families, and nearly a million elements overlapping potential promoter, enhancer and insulator regions. We report specific amino acid residues that have undergone positive selection, 280,000 non-coding elements exapted from mobile elements and more than 1,000 primate- and human-accelerated elements. Overlap with disease-associated variants indicates that our findings will be relevant for studies of human biology, health and disease. Chromatin profiling has emerged as a powerful means for annotating genomic elements and detecting regulatory activity. 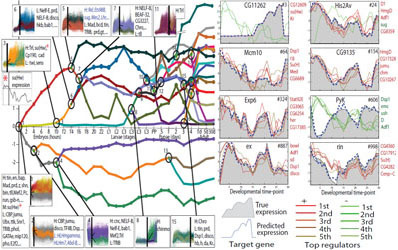 Here we generate and analyze a compendium of epigenomic maps for nine chromatin marks across nine cell types, in order to systematically characterize cis-regulatory elements, their cell type-specificities, and their functional interactions. We first identify recurrent combinations of histone modifications and use them to annotate diverse regulatory elements including promoters, enhancers, transcripts and insulators in each cell type. We next characterize the dynamics of these elements, revealing meaningful patterns of activity for promoter states and exquisite cell type-selectivity for enhancer states. 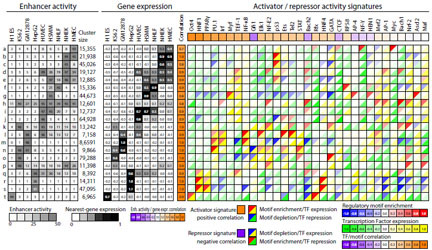 We define multi-cell activity profiles that reflect the patterns of enhancer state activity across cell types, as well as analogous profiles for gene expression, regulatory motif enrichments, and expression of the corresponding regulators. We use correlations between these profiles to link candidate enhancers to putative target genes, to infer cell type-specific activators and repressors, and to predict and validate functional regulator binding motifs in specific chromatin states. These functional annotations and regulatory predictions enable us to revisit intergenic single-nucleotide polymorphisms (SNPs) associated with human disease in genome-wide association studies (GWAS). 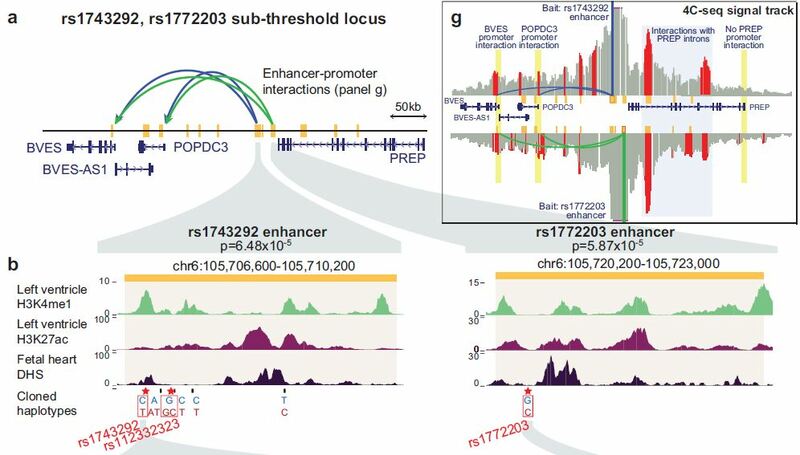 We find that for several diseases, topscoring SNPs are precisely positioned within enhancer elements specifically active in relevant cell types. 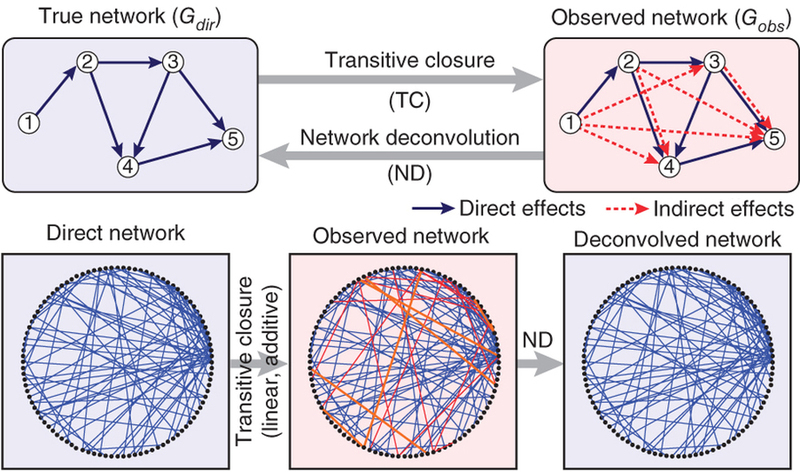 In several cases a disease variant affects a motif instance for one of the predicted causal regulators, thus providing a potential mechanistic explanation for the disease association. Our study presents a general framework for applying multi-cell chromatin state analysis to decipher cis-regulatory connections and their role in health and disease. Following the sequencing of human and model organism genomes, genome-wide annotation of regulatory information has emerged as a major challenge. Here we describe an initial map of the Drosophila melanogaster regulatory genome based on the developmental dynamics of chromatin modifications and chromatin modifying enzymes, on polymerase occupancy of promoters, on the dynamic binding of enhancer-associated proteins such as the transcriptional co-factor CBP, and on the localization of forty-one site-specific transcription factors at different stages of development. The entire dataset provides protein modification and binding annotations across 94% of the genome along with prediction and validation of 4 classes of regulatory elements: insulators, promoters, silencers and enhancers. 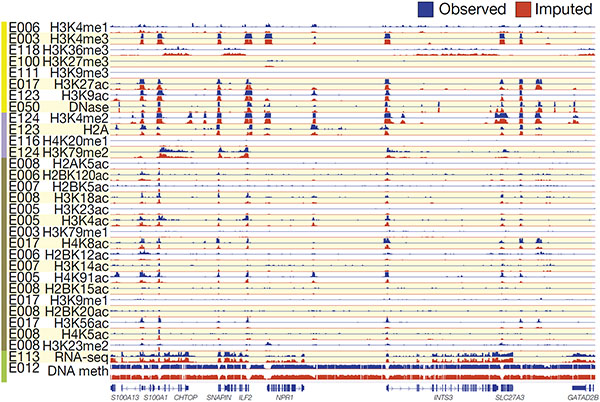 This regulatory map reveals several newly discovered properties of genome regulation, including the lack of epigenetic marks at promoters of transiently expressed genes, the association of specific Histone Deacetylases (HDACs) with Polycomb Response Elements, the early role of CBP as a marker of enhancers and the occurence of high-occupancy transcription factor binding sites that correlate with gene expression. 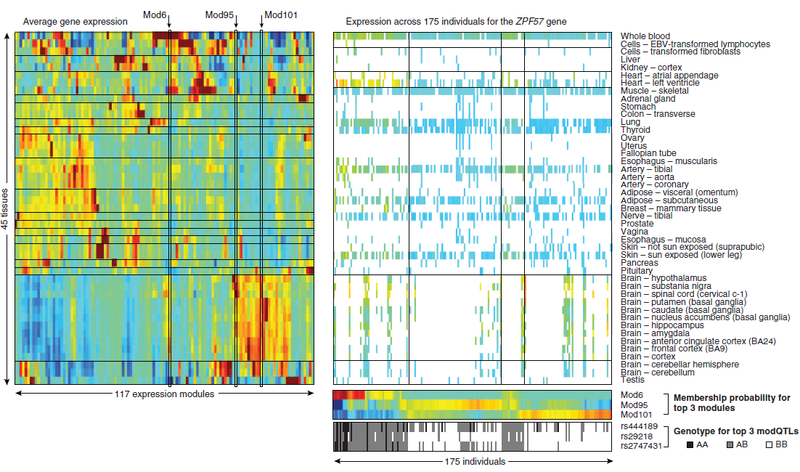 Using these data we also generated a combinatorial analysis of transcription factors and DNA sequence motifs that are associated with different sets of developmentally co-expressed genes, providing a database for discovering the sets of regulatory inputs that control regulatory element function. 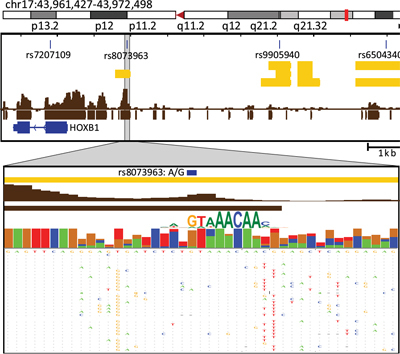 Together, these cis-regulatory annotations serve as a foundation for further detailed analyses of the genomic regulatory code in Drosophila. Nature 471:527-531, March 23, 2011. Several years after the initial sequencing of the genomes from human and other organisms, the vast majority of each genome remains unannotated, and it is still unclear how to translate genomic information into a functional map of cellular and developmental programs. To address this question, the Drosophila modENCODE project has undertaken a large-scale effort to comprehensively map transcription, regulator binding, chromatin state, replication, and nucleosome properties across a developmental time-course and in multiple cell lines. Here, we report our initial integrative analysis of the first phase of the project, encompassing more than 1000 datasets generated over four years across six production centers. Our integrated annotation enabled the discovery of new proteincoding, non-coding, RNA regulatory, replication, and chromatin elements that more than triple the annotated portion of the genome. We study correlated activity patterns of these elements to infer a functional regulatory network, which we use to predict putative functions for new genes, reveal stage-specific and tissue-specific regulators, and infer predictive models of gene expression. Our results provide a reference annotation that can inform directed experimental and computational studies in Drosophila and related species, and provide a model for systematic data integration towards the comprehensive genomic and functional annotation of any genome, including the human. 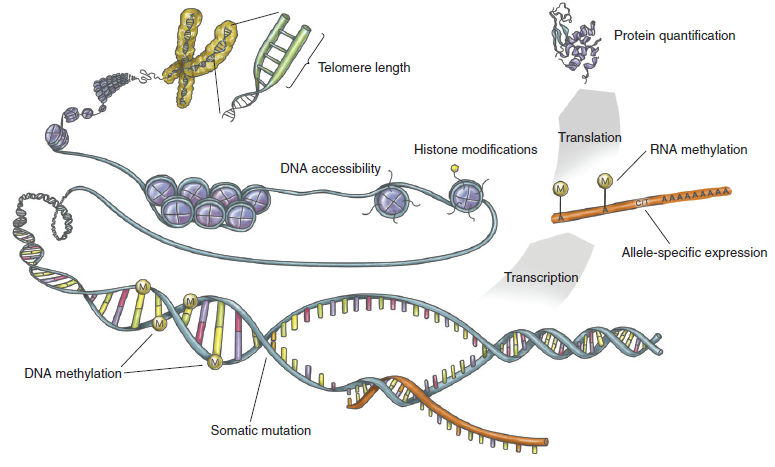 A plethora of epigenetic modifications have been described in the human genome and shown to play diverse roles in gene regulation, cellular differentiation and the onset of disease. Although individual modifications have been linked to the activity levels of various genetic functional elements, their combinatorial patterns are still unresolved and their potential for systematic de novo genome annotation remains untapped. Here, we use a multivariate Hidden Markov Model to reveal 'chromatin states' in human T cells, based on recurrent and spatially coherent combinations of chromatin marks. We define 51 distinct chromatin states, including promoter-associated, transcription-associated, active intergenic, large-scale repressed and repeat-associated states. Each chromatin state shows specific enrichments in functional annotations, sequence motifs and specific experimentally observed characteristics, suggesting distinct biological roles. This approach provides a complementary functional annotation of the human genome that reveals the genome-wide locations of diverse classes of epigenetic function. Candida species are the most common cause of opportunistic fungal infection worldwide. Here we report the genome sequences of six Candida species and compare these and related pathogens and non-pathogens. There are significant expansions of cell wall, secreted and transporter gene families in pathogenic species, suggesting adaptations associated with virulence. Large genomic tracts are homozygous in three diploid species, possibly resulting from recent recombination events. Surprisingly, key components of the mating and meiosis pathways are missing from several species. 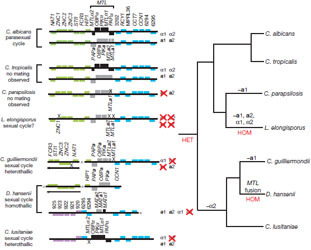 These include major differences at the mating-type loci (MTL); Lodderomyces elongisporus lacks MTL, and components of the a1/2 cell identity determinant were lost in other species, raising questions about how mating and cell types are controlled. Analysis of the CUG leucine-to-serine genetic-code change reveals that 99% of ancestral CUG codons were erased and new ones arose elsewhere. Lastly, we revise the Candida albicans gene catalogue, identifying many new genes. 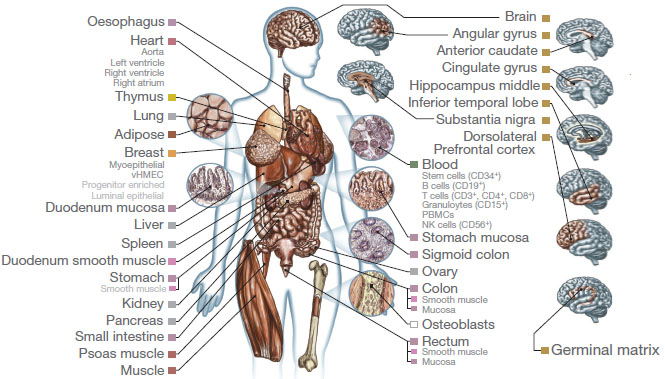 The human body is composed of diverse cell types with distinct functions. Although it is known that lineage specification depends on cell-specific gene expression, which in turn is driven by promoters, enhancers, insulators and other cis-regulatory DNA sequences for each gene, the relative roles of these regulatory elements in this process are not clear. We have previously developed a chromatin-immunoprecipitation-based microarray method (ChIP-chip) to locate promoters, enhancers and insulators in the human genome. 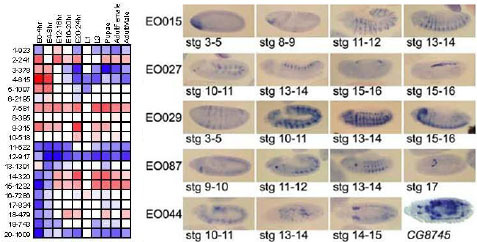 Here we use the same approach to identify these elements in multiple cell types and investigate their roles in cell-type-specific gene expression. We observed that the chromatin state at promoters and CTCF-binding at insulators is largely invariant across diverse cell types. 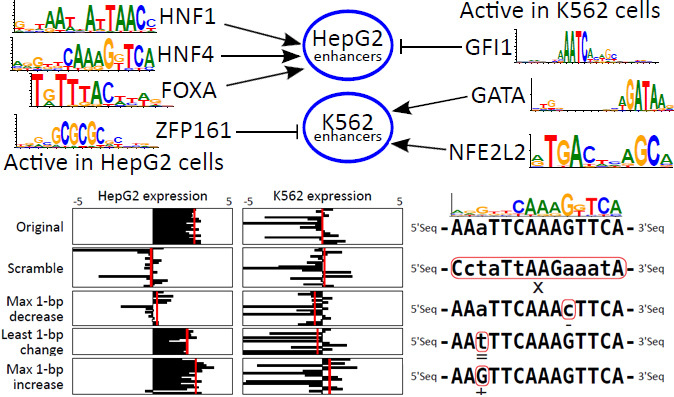 In contrast, enhancers are marked with highly cell-type-specific histone modification patterns, strongly correlate to cell-type-specific gene expression programs on a global scale, and are functionally active in a cell-type-specific manner. Our results define over 55,000 potential transcriptional enhancers in the human genome, significantly expanding the current catalogue of human enhancers and highlighting the role of these elements in cell-type-specific gene expression. There is growing recognition that mammalian cells produce many thousands of large intergenic transcripts. However, the functional significance of these transcripts has been particularly controversial. Although there are some well-characterized examples, most (>95%) show little evidence of evolutionary conservation and have been suggested to represent transcriptional noise. Here we report a new approach to identifying large non-coding RNAs using chromatin-state maps to discover discrete transcriptional units intervening known protein-coding loci. Our approach identified approximately 1,600 large multi-exonic RNAs across four mouse cell types. In sharp contrast to previous collections, these large intervening non-coding RNAs (lincRNAs) show strong purifying selection in their genomic loci, exonic sequences and promoter regions, with greater than 95% showing clear evolutionary conservation. We also developed a functional genomics approach that assigns putative functions to each lincRNA, demonstrating a diverse range of roles for lincRNAs in processes from embryonic stem cell pluripotency to cell proliferation. We obtained independent functional validation for the predictions for over 100 lincRNAs, using cell-based assays. In particular, we demonstrate that specific lincRNAs are transcriptionally regulated by key transcription factors in these processes such as p53, NFkappaB, Sox2, Oct4 (also known as Pou5f1) and Nanog. Together, these results define a unique collection of functional lincRNAs that are highly conserved and implicated in diverse biological processes. Comparative genomics of multiple related species is a powerful methodology for the discovery of functional genomic elements, and its power should increase with the number of species compared. Here, we use 12 Drosophila genomes to study the power of comparative genomics metrics to distinguish between protein-coding and non-coding regions. First, we study the relative power of different comparative metrics and their relationship to single-species metrics. We find that even relatively simple multi-species metrics robustly outperform advanced single-species metrics, especially for shorter exons (< or =240 nt), which are common in animal genomes. Moreover, the two capture largely independent features of protein-coding genes, with different sensitivity/specificity trade-offs, such that their combinations lead to even greater discriminatory power. In addition, we study how discovery power scales with the number and phylogenetic distance of the genomes compared. We find that species at a broad range of distances are comparably effective informants for pairwise comparative gene identification, but that these are surpassed by multi-species comparisons at similar evolutionary divergence. In particular, while pairwise discovery power plateaued at larger distances and never outperformed the most advanced single-species metrics, multi-species comparisons continued to benefit even from the most distant species with no apparent saturation. Last, we find that genes in functional categories typically considered fast-evolving can nonetheless be recovered at very high rates using comparative methods. Our results have implications for comparative genomics analyses in any species, including the human. The availability of sequenced genomes from 12 Drosophila species has enabled the use of comparative genomics for the systematic discovery of functional elements conserved within this genus. We have developed quantitative metrics for the evolutionary signatures specific to protein-coding regions and applied them genome-wide, resulting in 1193 candidate new protein-coding exons in the D. melanogaster genome. We have reviewed these predictions by manual curation and validated a subset by directed cDNA screening and sequencing, revealing both new genes and new alternative splice forms of known genes. We also used these evolutionary signatures to evaluate existing gene annotations, resulting in the validation of 87% of genes lacking descriptive names and identifying 414 poorly conserved genes that are likely to be spurious predictions, noncoding, or species-specific genes. Furthermore, our methods suggest a variety of refinements to hundreds of existing gene models, such as modifications to translation start codons and exon splice boundaries. Finally, we performed directed genome-wide searches for unusual protein-coding structures, discovering 149 possible examples of stop codon readthrough, 125 new candidate ORFs of polycistronic mRNAs, and several candidate translational frameshifts. These results affect >10% of annotated fly genes and demonstrate the power of comparative genomics to enhance our understanding of genome organization, even in a model organism as intensively studied as Drosophila melanogaster. Whole-genome duplication followed by massive gene loss and specialization has long been postulated as a powerful mechanism of evolutionary innovation. Recently, it has become possible to test this notion by searching complete genome sequence for signs of ancient duplication. Here, we show that the yeast Saccharomyces cerevisiae arose from ancient whole-genome duplication, by sequencing and analysing Kluyveromyces waltii, a related yeast species that diverged before the duplication. 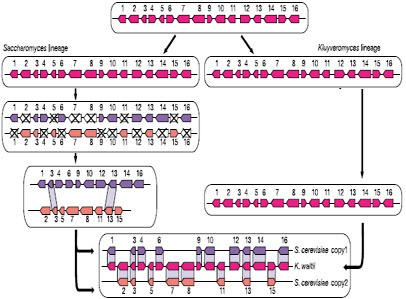 The two genomes are related by a 1:2 mapping, with each region of K. waltii corresponding to two regions of S. cerevisiae, as expected for whole-genome duplication. This resolves the long-standing controversy on the ancestry of the yeast genome, and makes it possible to study the fate of duplicated genes directly. Strikingly, 95% of cases of accelerated evolution involve only one member of a gene pair, providing strong support for a specific model of evolution, and allowing us to distinguish ancestral and derived functions. Identifying the functional elements encoded in a genome is one of the principal challenges in modern biology. Comparative genomics should offer a powerful, general approach. Here, we present a comparative analysis of the yeast Saccharomyces cerevisiae based on high-quality draft sequences of three related species (S. paradoxus, S. mikatae and S. bayanus). We first aligned the genomes and characterized their evolution, defining the regions and mechanisms of change. We then developed methods for direct identification of genes and regulatory motifs. The gene analysis yielded a major revision to the yeast gene catalogue, affecting approximately 15% of all genes and reducing the total count by about 500 genes. The motif analysis automatically identified 72 genome-wide elements, including most known regulatory motifs and numerous new motifs. We inferred a putative function for most of these motifs, and provided insights into their combinatorial interactions. The results have implications for genome analysis of diverse organisms, including the human. We describe our experience with a new algorithm for the reconstruction of surfaces from unorganized sample points in 3D. The algorithm is the first for this problem with provable guarantees. Given a "good sample" from a smooth surface, the output is guaranteed to be topologically correct and convergent to the original surface as the sampling density increases. The definition of a good sample is itself interesting: the required sampling density varies locally, rigorously capturing the intuitive notion that featureless areas can be reconstructed from fewer samples. The output mesh interpolates, rather than approximates, the input points. 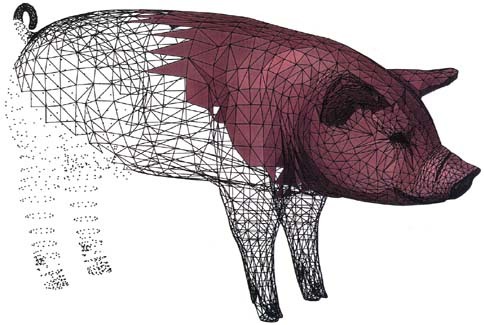 Our algorithm is based on the three-dimensional Voronoi diagram. Given a good program for this fundamental subroutine, the algorithm is quite easy to implement. ACM SIGGRAPH, v. 32, p. 415-421, Jul 19, 1998.